Though the early stages of his career in the 1960s were rooted in Abstract Expressionism, Suk-Won Park’s practice since the 1970s have acquired minimalistic traits, earning him a status as one of the most representative artists of Korean abstract sculpture. Park’s pieces usually segment and combine essential geometric stone elements, placed in different positions. 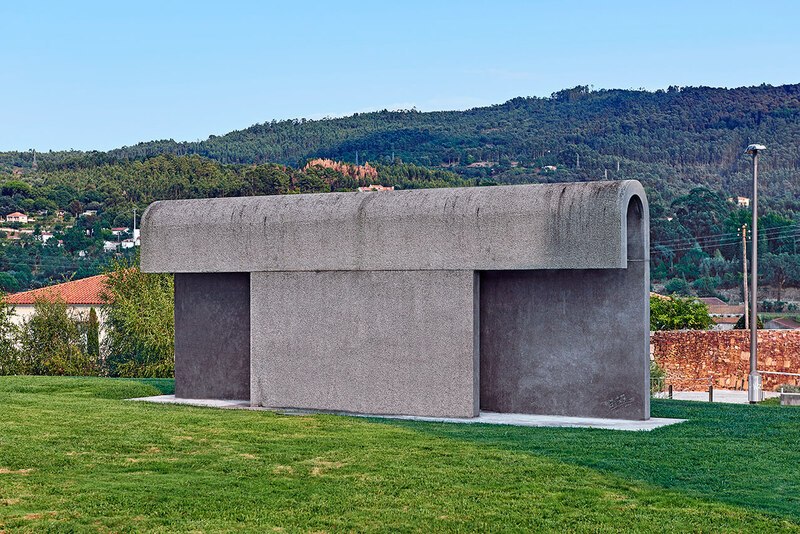 The work that Suk-Won Park built in Santo Tirso is at the confluence of Sculpture and Architecture. A place of prayer and retreat, or a memorial arch, it certainly conveys a disturbing ambiguity. Opening on the flanks and frontally impenetrable, the piece differs from the great classical arches, and rather looks like a small shelter or a domed crib-shaped corridor. In addition to the simple lines and austere materials, its lack of colour bears the gravity of funerary sculpture. In any case, its scale is undeniably human, as if made to contain the warmth of a body. Its double presentation — one side open, the other side closed — is not the result of random chance, but deliberately suggests a protective embrace. For all these reasons, the piece’s intimate nature encourages introspection, in spite of its formal severity.